MainBlogsFundamentally FreundWill the Dead Rest in Peace? Will the Dead Rest in Peace? You can tell a lot about your foes not only by how they treat the living, but also by their attitude towards the dead. Recent media attention regarding the fate of the Jewish cemetery in Gush Katif, and the Government's plan to uproot it for fear the Palestinians will desecrate it, serve as a telling reminder of the true nature of our prospective "partners in peace". As I note in the article below from the Jerusalem Post, this should be considered the "cemetery test" of peace - namely, that if your foe can not even muster the basic human decency to respect the dead, then chances are you won't be able to make peace with him any time soon. Israel has turned 57, and in conjunction with its birthday the country will be getting a new military unit: the IDF "disinterment division." According to a recent Maariv report, the army has secretly established a special reserve unit tasked with exhuming the 47 Jewish graves located in the Gush Katif cemetery as part of preparations for the planned withdrawal from Gaza this summer. The unit, which will reportedly operate under the direct authority of the Defense Ministry, was slated to begin functioning shortly after Independence Day, when it will start to train for its grisly and macabre task. Among those buried in the cemetery that is slated for destruction are soldiers who died while serving the country and civilians who were murdered by Palestinian terrorists. This was perhaps one of the most chilling news items that I can recall reading in a long, long time. The very idea that a Jewish army – our army! – would be ordered to establish such a unit, with the express purpose of demolishing a Jewish cemetery and digging up Jewish graves for purposes of relocating them, should send a chill down our collective spines. Is this what Israel has come to? The government's argument, of course, is that it has no choice in the matter in light of Prime Minister Ariel Sharon's insistence on leaving Gaza. Yonatan Bassi, head of the Disengagement Authority, said last month that "no graves can be left in enemy territory." Bassi hardly needed to spell out why – after all, if a Jewish cemetery were to remain in Gaza after an Israeli retreat, one can only imagine how the Palestinians would behave toward the site. Anyone remember what they did to Joseph's Tomb in Nablus (Shechem) in the autumn of 2000, when a frenzied Palestinian mob set the site on fire and tore down the building which housed it brick by brick? Jewish prayer books and other religious articles left behind by the retreating Israeli army were set alight by the crowd, which danced and celebrated their desecration of a sacred Jewish site. 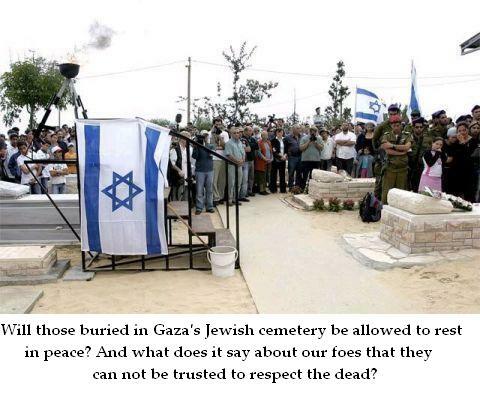 It seems safe to assume that after an Israeli departure from Gaza, the Palestinians would demonstrate a similar level of "respect" for the Jews who are buried there as well. Clearly, the government is aware of this problem, which is why it is so anxious to remove the Jewish graves from Gush Katif. While Sharon has said that "No graves will be moved without full cooperation from the families," he also insisted that "We must try to convince those who object, and explain the importance of this move." But what seems to escape the prime minister is what this situation says about our ostensible Palestinian partners. They won't let us live in peace, and they won't let our dead rest in peace either. If Israel finds itself confronting a foe that is incapable of showing even a modicum of respect for the dead, is it really wise to strengthen that foe still further by handing over more territory to his control? Call it "the cemetery test" – namely, if your opponent cannot muster the basic amount of decency necessary to refrain from desecrating a burial ground, for G-d's sake, then chances are you won't be able to make peace with him any time soon. Since the Palestinians don't come close to passing this test, it should be obvious that it is not in Israel's interest to embolden them further by uprooting the residents of Gush Katif – living and dead – and fleeing the scene. In Hebrew, the term used for cemetery is beit almin, which is taken from the Aramaic and translates literally as "everlasting home." This is no coincidence. Once a person has been buried, it is only in the most extreme of circumstances that his or her eternal rest should ever be disturbed. Judaism has long placed enormous importance on the need to respect the dead. It is time that our government – a Jewish government – did the same.